In 1943, with the German Sixth Army annihilated at Stalingrad and Rommel’s Afrika Korps in full retreat after defeat at El Alamein, Winston Churchill’s War Cabinet met to discuss the opening of a new front. Its battles would be fought not on the beaches of Normandy or in the jungles of Burma but amid the blizzards and glaciers of the Antarctic. Originally conceived as a means by which to safeguard the Falkland Islands from Japanese invasion and to deny harbours in the sub-Antarctic territories to German surface raiders and U-boats, the expedition also sought to re-assert British sovereignty in the face of incursions by neutral Argentina. As well as setting in train a sequence of events that would eventually culminate in the Falklands War, the British bases secretly established in 1944 would go on to play a vital part in the Cold War and lay the foundations for one of the most important and enduring government-sponsored programmes of scientific research in the polar regions: the British Antarctic Survey. 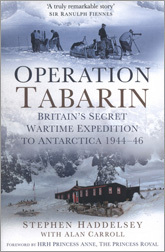 Based upon contemporary sources, including official reports and the diaries and letters of the participants, Operation Tabarin tells for the first time the story of this, the only Antarctic expedition to be launched by any of the combatant nations during the Second World War and one of the most curious episodes in what Ernest Shackleton called ‘the white warfare of the south’.